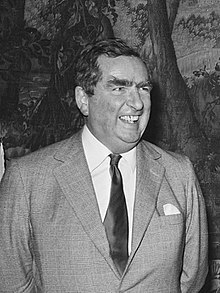 Denis Winston Healey, Baron Healey PC (30 August 1917 – 3 October 2015) was a British Labour Party politician who served as Secretary of State for Defence from 1964 to 1970 and Chancellor of the Exchequer from 1974 to 1979. He was a Member of Parliament for 40 years (from 1952 until his retirement in 1992) and was the last surviving member of the cabinet formed by Harold Wilson after the Labour Party's victory in the 1964 general election. On BBC Television's Panorama programme (22 January, 1968). I warn my hon. Friends...that once we cut defence expenditure to the extent where our security is imperilled, we have no houses, we have no hospitals, we have no schools. We have a heap of cinders. Speech in the House of Commons (5 March 1969). We are all agreed on a massive extension of public ownership...We are all agreed on establishing comprehensive planning control over the 100 or so largest companies in Britain. We are all agreed on the need for a national enterprise board to organise and extend public ownership in the profitable manufacturing industries. Speech in York (2 June 1973), quoted in The Times (4 June 1973), p. 2. We shall increase income tax on the better off so that we can help the hundreds of thousands of families now tangled helplessly in the poverty trap by raising the tax threshold and introducing reduced rates of tax for those at the bottom of the ladder. I warn you, there are going to be howls of anguish from the rich. But before you cheer too loudly let me warn you that a lot of you will pay extra taxes too. Speech to the Labour Party Conference at Blackpool (1 October, 1973). Speech in Lincoln (18 February 1974), quoted in The Times (19 February 1974), p. 4. Misreported as "tax the rich until the pips squeak". "The pips squeak" metaphor was originated by Sir Eric Campbell-Geddes and later used by David Lloyd-George. It has never been my nature, I regret to admit to the House, to turn the other cheek. Speech in the House of Commons (18 December 1974). No country would suffer more than Britain from an international trade war, since we depend more on world trade than any of our competitors. That is why we cannot accept the proposal made in some quarters that we should seek to solve our problems through imposing import controls for a long period over a whole range of manufactured consumer goods. Speech in the House of Commons (17 December 1975). He must be out of his tiny Chinese mind. Attacking Ian Mikardo, a left-wing critic of spending cuts, using a phrase of the comedienne Hermione Gingold (The Daily Telegraph, 24 February, 1976), quoted in Denis Healey The Time of My Life (Penguin, 1990), p. 444. By the end of next year, we really shall be on our way to that so-called economic miracle we need. In an Ministerial broadcast on the Budget (6 April 1976). If we can keep our heads—and our nerve—the long-awaited economic miracle is in our grasp. Britain can achieve in the Seventies what Germany and France achieved in the Fifties and Sixties. The Sunday Telegraph (4 July 1976). The alternative to getting help from the IMF would be economic policies so savage I think they would produce riots in the streets, an immediate fall in living standards and unemployment of three million. On ITN's News at Ten (29 September 1976). Speech at the Labour Party Conference (30 September 1976), quoted in Labour Party Annual Conference Report 1976, p. 319. Healey had been forced to abandon plans to attend an international finance ministers' conference in order to speak to the conference because of a run on the pound. No Government can produce an economic miracle. An economic miracle depends on people on the shop floor, in the board room, in the sales office, working a bit harder and more efficiently than they have worked in the past. On BBC TV (15 December 1976). I must say that part of his speech was rather like being savaged by a dead sheep. NATO's nuclear strategy is an essential part of that balance [between East and West]. To threaten to upset it by refusing to let America base any of her nuclear weapons in Britain would make war more likely, not less likely. The Guardian (14 August 1981). I would fight to change the policy before the General Election. If I failed then I wouldn't accept office in a Labour Government. On unilateral nuclear disarmament. (The Guardian, 15 September 1981). Faced with the difficulties of unilateral reflation, some socialists are tempted to seek salvation through trade restrictions or competitive devaluation. But such beggar-my-neighbour policies, if pursued on the scale required...are more likely to lead to a trade and currency war than to insulate their sponsors from the recession in the outside world. We will unilaterally get rid of Trident and cruise, and we will put Polaris into the arms talks with the Soviet Union and hope to phase it out in multilateral negotiations. If the Russians...fail to cut their nuclear forces accordingly it would be a new situation that we could consider at that time. [Margaret Thatcher] wraps herself in the Union Jack and exploits the sacrifices of our soldiers, sailors and airmen in the Falkland Islands for purely party advantage – and hopes to get away with it. It wasn't a very credible approach from the word 'go' because this Prime Minister, who glories in slaughter, who has taken advantage of the superb professionalism of our armed forces, is at this very moment lending the military dictatorship in Buenos Aires millions of pounds to buy weapons – including weapons made in Britain – to kill British servicemen. That is an act of stupefying hypocrisy. What almost halved the support for the Labour Party was the feeling that it has lost its traditional common sense and its humanity to a new breed of sectarian extremism. On the 1983 general election (The News of the World, 19 June 1983). So long as the Soviet Union has nuclear weapons there have to be nuclear weapons somewhere in NATO to deter them from using them. The Tribune (28 March 1986). The reason we were defeated in so far as defence played a role is that people believe we were in favour of unilaterally disarming ourselves. It wasn't the confusion. It was the unilateralism that was the damaging thing. We are going through a period of uncertainty, but we are in a good position to strengthen ourselves and win back a majority. We have already got rid of much deadwood and Kinnock is winning back younger voters. He is politically intelligent, has character and courage; but he has never been a minister, lacks experience, and people know it. In troubled times, the electorate looks for a strong leader and Mrs Thatcher is seen as one. The US, whether we like it or not, has nuclear weapons. The US is a member of NATO. Possession by the US of nuclear weapons is obviously a deterrent. The London Standard (30 September 1986). No. Absolutely not. I think that the Russians are praying for a Labour victory...praying is perhaps an unfortunate choice of words. I think that they would much prefer a Labour government and that the idea that they would prefer a Tory government, I think is utter bunkum, and they [the Soviets] authorized me to say so. Answering a suggestion that the Soviets would prefer a Conservative government led by Margaret Thatcher than a Labour government headed by Neil Kinnock at a press conference in Moscow after a meeting with Anatoly Dobrynin (11 May 1987), quoted in E. B. Geelhoed, Margaret Thatcher: In Victory and Downfall, 1987 and 1990 (Greenwood, 1992), pp. 120-1. The trouble about Europe is what I call the Olive Line, the line below which people grow olives. North of the Olive Line people pay their taxes and spend public money very cautiously. South of it they fail to pay their taxes at all, but spend a lot of public money. Denis Healey was a great champion for social justice, in and out of government, a stalwart of the Labour Party, a true patriot who fought for and cared deeply about his country and an extraordinary and vibrant character...He steered the Labour government and the country through some of the most difficult economic times; and in winning the deputy leadership of the Labour Party in 1981, he probably saved the Labour Party as an instrument of government and social change. All of us in the Labour Party owe him a huge debt. Britain has lost a dedicated and faithful public servant. Denis Healey was a giant of the Labour Party whose record of service to his party and his country stands as his testament...His wit and personality transcended politics itself, making him one of the most recognisable politicians of his era. Speaking personally, we had many interesting conversations when I was first elected to Parliament in 1983 and I found him a decent and very knowledgeable man who I enjoyed engaging with, particularly in his work as shadow foreign secretary. He has long carried light ideological baggage on a heavy gun carriage. Roy Jenkins, A Life at the Centre (London: Macmillan, 1991), p. 617. He didn't suffer fools gladly or, indeed, at all. That partly explains why he was never leader of the party despite having rich political talent. He was brilliant in the Commons, an ebullient campaigner in the country, and his piano-thumping performances in by-election sing-songs were - like him - loud, lively, and uplifting...To know Denis Healey was to enjoy him. The right hon. Gentleman will be known for ever as the only Chancellor in the post-war period who brought this country to the brink of bankruptcy. Margaret Thatcher responding to criticism by Healey (12 July 1990). This page was last edited on 4 February 2019, at 21:09.